Adnan Morshed’s allegory of the oculus—a circular recess at the apex of a dome—as a way of seeing things from an unusual angle, with both engaged subjectivity and dispassionate distance, works well for some of the poignant developmental issues of Bangladesh. He lives away from his motherland, a detachment that he uses not for nostalgic reminiscences, but as a global citizen’s intellectual fodder for distant observations of his birthplace. Refusing any fixed partisan perch, he takes up issues, from environmental stewardship to the politics of the digital media, from urbanization to tourism, and dissects them to offer thought-provoking interpretations. He employs a language that is simultaneously sharp, witty, lucid, melancholic, oblique, metaphorical, and empathetic. 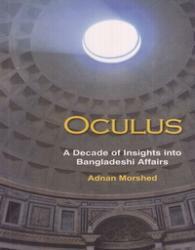 The reader will find in this book a range of nuanced readings of some of the most vexing topics in Bangladesh. Adnan Morshed is ruthless in his critique, but, ultimately, he offers remedies that are nourished with optimism and compassion. What should make this book appealing to lay readers and specialists alike is the irresistible multidisciplinary element and historical references embedded in the narrative of the book. These collected essays offer an anthropological richness and readability, making the book a pithy reference to the culture, history, society, and politics of Bangladesh. It should appeal to a wide readership: international aid agencies, policymakers, diplomats, historians, anthropologists, sociologists, environmental activists, urban planners, and literary enthusiasts.